Visiting big cities is exciting. You’ve seen all the sights in pictures and movies, but experiencing them in the flesh is something you’ve always wanted to do. Your choice is how to get around and see them all. Looking for environmentally friendly and efficient ways to see the city, you may consider the option of open-top bus tours; hopping on and off or finding your own way on public transport. But what if you want more freedom to explore? What if you want to find your own route and see the city in a sustainable way? Many cities now have the answer. Many of these bicycle share schemes have been established to help commuters. By giving people the option to grab a bike at a station and ride a short distance to the office, it cuts down commuting times and makes public transport a viable option for more people. 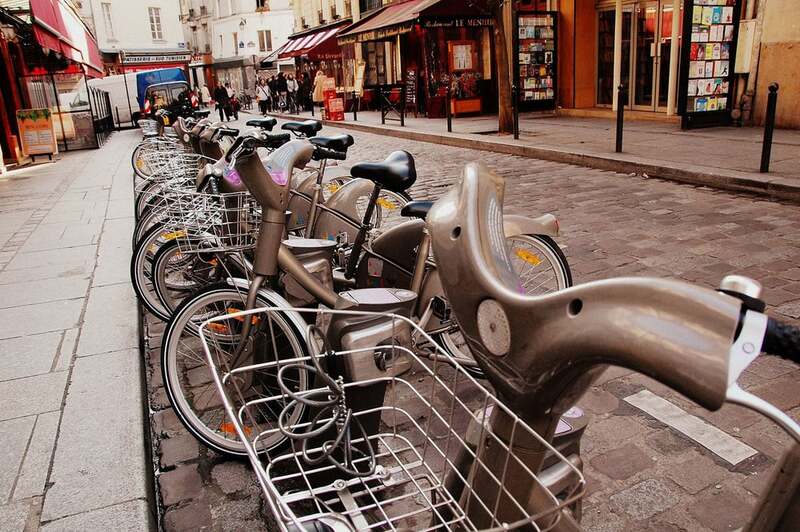 With rental stations dotted around city centers, it makes the bikes perfect for hopping between tourist attractions. The way the bicycle share scheme works is simple. You pick up a bike at a rental point near your starting location, ride it to the next destination, and then return it to a nearby docking station. Rent, cycle, dock, repeat. All you generally need to access these bikes is a credit card. Access for 24 hours tends to be a small nominal amount ($2 or €2 or £2) and every journey less than 30 minutes is free. The cost of the bike use increases if you have it out for more than 30 minutes at a time (another $2 or €2 or £2 per additional 30 minutes), but with the number of docking stations available, it’s not usually necessary to keep a bike for very long. Helmets are one of the sticking points with bicycle share schemes. Lack of convenient availability is the most important factor for most schemes, and bringing your own helmet is not always possible. Melbourne is one city that aims to have helmets available and free to use at docking stations. Additionally there are shops across the city selling helmets for $5 (AUD). Your alternatives are sadly fairly limited when traveling. Carrying your own helmet may be an option, but the space it requires in the suitcase is far from ideal. Unless you’re interested in an expensive airbag-helmet-alternative, the only folding helmets currently available on the market are still bulky. Hopefully there will be a great helmet option for travelers in the future! Although the bicycle share scheme does have an environmental impact—vehicles are needed to redistribute bikes around stations to meet demand—it's still better for the planet than other public transport options. You as a traveler save approximately 0.35kg (0.77lb) of CO2 per mile you cycle [source]. This makes bike shares, with the thousands of miles used every day, a force for environmental change. Some cities implementing the bike share schemes have seen increases in cycle commuters (using their own bikes), with some referring to the system as the “gateway drug” to cycling in the city. Known locally as Boris Bikes (after Boris Johnson, the mayor of London who ushered in the program), London has more than 11,500 bikes and 700 docking stations spread across much of the city's central and eastern areas. Transport for London has a few interesting routes that will take you around interesting and quirky parts of the city. Santander (Boris bikes) in London. The appropriately-named Citi sponsors the bikes in the NYC area. The Citi bike share scheme spans New York City and New Jersey, covering central and lower Manhattan, and areas on either side of NYC with 6,000 bikes and 332 stations. Future plans include doubling the number of bikes and stations, and spreading service to areas including Brooklyn, upper Manhattan, Astoria, and Long Island City. There are already more than 34,000 trip taken daily. Melbourne isn’t a huge city, and neither is its bike share. There are only 50 stations, but they are coupled with many roads and separated paths that are perfect for cycling without the traffic worries. Some beautiful cycle routes in the city include along the Yarra River and around St Kilda on the waters of Port Phillip. With almost 100,000 daily rides, Vélib' in Paris is the largest bike share in the world outside of China. Demand is often very high, even with 14,500 bikes available in the city. Cases of people “illegally reserving” bicycles has been seen, with some users attaching a personal lock to a bike to prevent anyone else from using it. This goes against the spirit of the scheme, and is certainly not encouraged, but it does serve to highlight the bike share's popularity. China leads the world in bike sharing schemes. Of the top 20 largest bikes shares in the world, China holds claim to 18, with only Paris and London sneaking in at 12th and 19th spot, respectively. This is the biggest bike share in the world with 78,000 bikes. Plans to increase that number to 175,000 by 2020 means Hangzhou is likely to hold on to that status for some time to come. Read more about Hangzhou in this paper looking at bicycle share schemes and their effectiveness. In the 6 years since ECOBICI launched in Mexico City, nearly 30 million journeys have been taken by locals and tourists. Although the scheme does not yet cover the entire city, the ECOBICI can be found in most of the tourist areas. Spotcycle phone app for finding bikes and stations in cities around the world. Although many cities have developed their own phone apps, Spotcycle offers an app giving you real-time information on bicycle and docking space availability for bike shares in 68 cities around the world. This useful app provides a rental timer to let you know when your first 30 minutes is running out, as well as the ability to check whether the dock at your desired destination has open spaces! Bike sharing schemes won't fully replace cars or public transport, but they do offer an enjoyable and environmentally friendly way to see a city's landmarks and get some exercise. The amount of waste created by single-use water bottles is pretty astounding. You may already be traveling with a reusable water bottle, or maybe you're looking to make a simple change to live and travel more sustainably. Cycling is a great way to get around cheaply and sustainably, but often it’s best left to those cities that have good infrastructure. If you’re out hiking, and want to kick up the fun level, a mountain bike may be the answer. See London’s iconic landmarks while minimizing your environmental impact through the city’s bike share scheme with this cycling route.